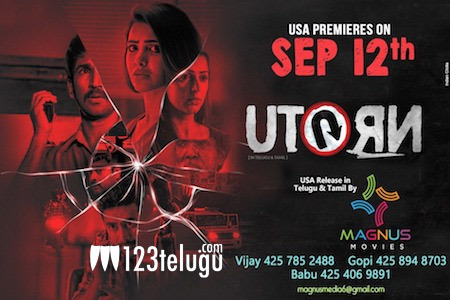 Persisting with our endeavor to support quality projects, Magnus Movies is extremely delighted to announce that we have acquired the USA rights of Samantha Ruth Prabhu-starrer ‘U-Turn’ for both Tamil and Telugu versions. The premieres of the film have been scheduled on September 12th in the USA, a day before the film’s official Indian theatrical release on September 13th for the Ganesh Chaturthi weekend. Also starring Aadhi Pinisetty, Rahul Ravindran, and Bhumika Chawla in important roles, U-Turn marks Samantha’s first women-centric film and is eagerly anticipated by her fans. Samantha has walked the extra mile by dubbing in her own voice for the film. Click Here!! for the Trailer in Telugu. Click Here!! for the Trailer in Tamil.